Yesterday, Senator Grace Poe admitted that she does not want pork barrel to be abolished from the list of benefits of public officials. She said lawmakers should always make sure that their pork barrel really goes to their constituents. Not to their own pockets, not to my pocket either. This is extremely a good thought from a political amateur who has a fresh eye on what is happening in the real world of dirty politics. She speaks of the ideal that has been rotting for ages. However, we are not talking about the ideals of a goodhearted public servant. We are dealing with the reality- the practice that our lawmakers are doing with our taxes. Recently, a few public officials were named to have been misusing their pork barrel funds. If the allegations were true, then these officials are truly and certified pork-producing pigs! In the past, we believed that misbehaving public officials are crocodiles (longest crocodile in captivity Lolong must have been a reincarnated public official). Now, they are pigs. When I checked on the list of the officials in bad light, I saw the name of an official from Benguet. Anyway, let’s give him the benefit of the doubt. Poe pointed out that transparency is lacking when it comes to the reporting of the proceeds of the pork barrel funds. Poe is very right. GMA 7’s Imbestigador should be focusing on this type of bigger issues, not on P100-worth of misbehaving people. 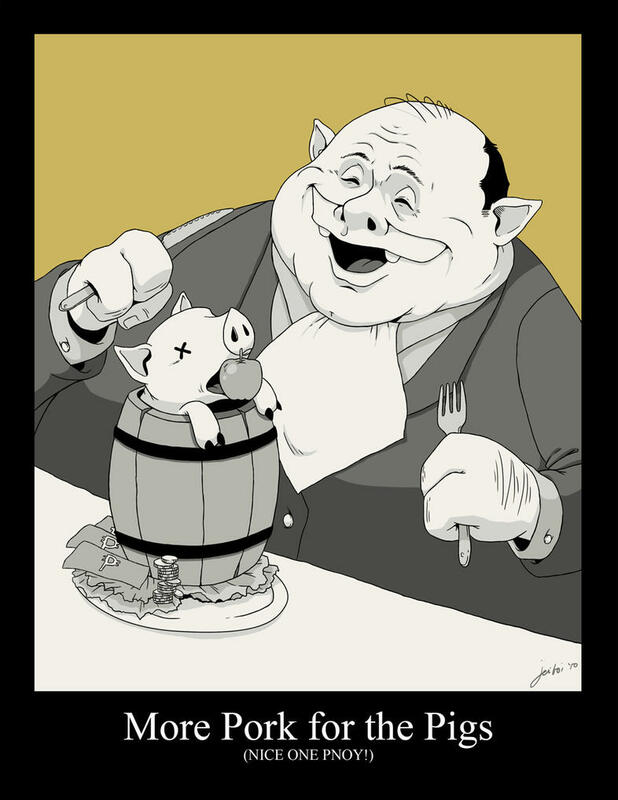 If pork barrel will be removed, where will the money go? To other new scams of course. Para-paraan lang yan! Lulusot din sila kahit anong mangyari!